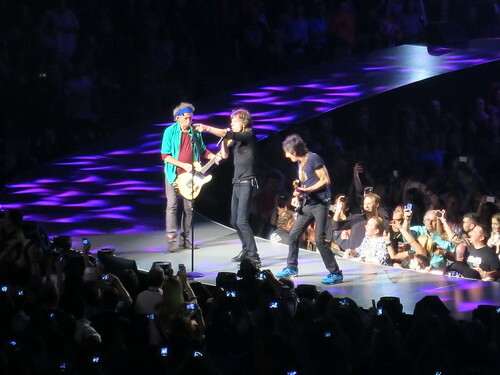 It had been a few years, me and Charlie and Keef and Ronnie and Mick. Sure, I saw them at 12-12-12, but the last time before that was 2002. I wouldn’t have even been here were it not for those magical $85 tickets, the Stones hating the scalpers so much they were doing everything they could to keep them out and get us in. The $85 tickets entitle you to a random envelope with two tickets in it; we had horrible seats in very upper level and just when I was resigned that at least they were side stage, but worried I wouldn’t be able to stand and dance, at 8:50 a gentleman appeared at our section with a stack of tickets and we were magically upgraded downstairs to the first level. Where there was plenty of room to dance, and no one sat down for any reason except to catch their breath. I WASN’T THERE, regrettably (sort of), I deliberately chose to sit this circuit out (and why is a much longer and very different post). But friends were there (many, many friends were there, from all over the world) and my best friend Sharon’s husband was kind enough to send me video clips of the moment, and I watched the (illegal) clip from the PPV multiple times last night because IT IS A MOMENT. I am generally not a fan of festivals, mega-concerts, or gimmicky guest appearances. I try to stay away from these things. However, the 12-12-12 Concert for Sandy Relief was a confluence of too many artists I cared about for me to avoid it, and we were lucky with tickets. 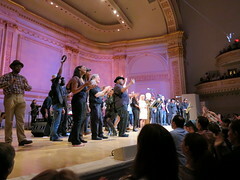 This was the most star-studded Carnegie tribute benefit show out of the five I have attended (Springsteen, R.E.M., The Who, Neil Young). The announced performers were strong from the outset, it didn’t feel like the organizers were scrambling for talent (which is what it seems like sometimes, with the lineup only filling out a few weeks before the actual show). That’s why it was so surprising that it was so uneven and ultimately unsatisfying. Despite me saying I didn’t think I wanted to see this tour, I couldn’t afford it, the usual complaints – that all changed when I landed great seats. I knew they were good, but I didn’t know exactly how good until I made my way to the floor during Sugar Ray’s (bleah) opening set. 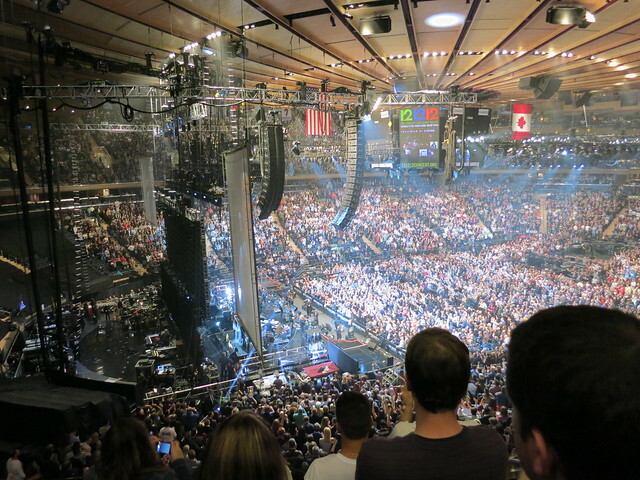 As I walked down the steps towards the floor I could feel it kicking in – that pre-show excitement. As I get older, I tend to not really FEEL it until I’m in the room and see the stage, and then it tumbles down a thousandfold. This time was no different, except when I was escorted to our seat location, which ended up being dead center at the front of the b-stage, second row. Even better, friends and familiar faces are all around us.